12 Ajaw 3 K’ayab (February 19, 2013): Double the impact of your donation! Thanks to the generosity of the KARON WINZENZ $1,000 MATCHING GRANT* and the MARLA AND BUDDY PERKEL $1,000 MATCHING GRANT every dollar you send us will be matched one-for-one until we reach our total goal of $4,000. DONATE $25 AND WE EARN $50! DONATE $50 AND WE EARN $100! DONATE $100 AND WE EARN $200! WE CAN DO THIS FOR OUR MAYA COLLEAGUES! 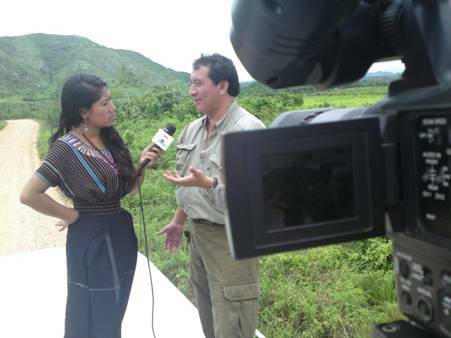 Antonio Cuxil being interviewed by Maya television, Antonio/Hector/Lolmay 2009-2010.